Interesting to find this campaign of Doorbusters Die-Cut and Not Headers. Most were Die Cut to have a rounded top profile to better stand out and call attention to themselves. Some however were left square. Yes, I did check to see if the squares where actually Die-Cut and just not punched out. They were not. So the square vs round was a purposeful strategy. Either version drops into standard sign holders as a special sale Header. 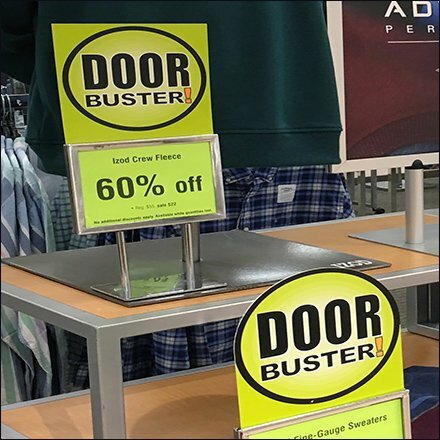 These Doorbusters Die-Cut and Not Headers seen at BonTon.